Between the middle of 2008 and late 2014 the Federal Reserve expanded the size of its balance sheet from around $900 billion to about $4.5 trillion. During that time, the Fed conducted three large-scale asset purchase (LSAP) programs, two of which specifically targeted agency mortgage-backed securities (MBS) and programs to reinvest principal paydowns. These programs altered the composition of the System Open Market Account’s (SOMA) domestic securities portfolio from one consisting entirely of U.S. Treasury securities to one including approximately 40 percent agency MBS (Figure 1).2 Overall, the Federal Reserve purchased over $4 trillion in agency MBS—fairly evenly split between LSAP and reinvestment purchases—with holdings peaking just below $1.8 trillion.3 I will focus my remarks today on the Federal Reserve’s experience with these purchases of agency MBS. Before I continue, I will note that the views I express are my own and do not necessarily reflect those of the Federal Reserve Bank of New York or the Federal Reserve System. The purchases of different types of assets will work through these channels in varying degrees. For example, sovereign assets will generally work primarily through the first five channels, while certain non-sovereign assets would also work through the credit or prepayment channels.6 Overall, the purchase of non-sovereign assets can be helpful by providing additional channels for monetary accommodation to be realized. In addition, it can allow central banks to overcome functional limitations that could exist if they were restricted to LSAPs in only one market—although the Federal Reserve is lucky to have very deep and liquid U.S. Treasury and agency MBS markets. However, adding a new asset class can also bring new challenges, requiring a central bank to learn more about an asset class and to build or refine the internal systems needed to operate in that market.11 Furthermore, the clearing, settlement and custody of agency MBS require unique attention.12 Finally, there may be political economy perspectives to consider when buying assets other than sovereign government debt, such as benefiting specific economic sectors or private entities. Many might argue that the main issuers in agency MBS gained private benefits at the expense of the taxpayers in the period prior to the financial crisis.13 An aversion to perceptions that agency MBS allocate credit across sectors of the economy could be a consideration in any future decision to undertake purchases. Since 2008, the Fed purchased agency MBS through two of its LSAP programs and through its reinvestment program.14 As I look back at these experiences, it is worth considering some lessons learned, and what remains to be learned, about their use. Research largely provides evidence that the LSAPs that the Fed conducted since reaching the zero lower bound (ZLB) in 2008 put downward pressure on longer-term interest rates and eased broader financial conditions, helping to improve macroeconomic outcomes. Estimates of the magnitude and persistence of the effects of the Fed’s purchase programs vary, as do assessments of the relative importance of the possible channels through which such programs are believed to work.15 Further, the importance of specific channels could have varied given distinct market conditions and economic environments at the time each program was initiated. In LSAP 1, announced in November 2008, agency MBS purchases had a stated purpose to "reduce the cost and increase the availability of credit for the purchase of houses, which in turn should support housing markets and foster improved conditions in financial markets more generally. 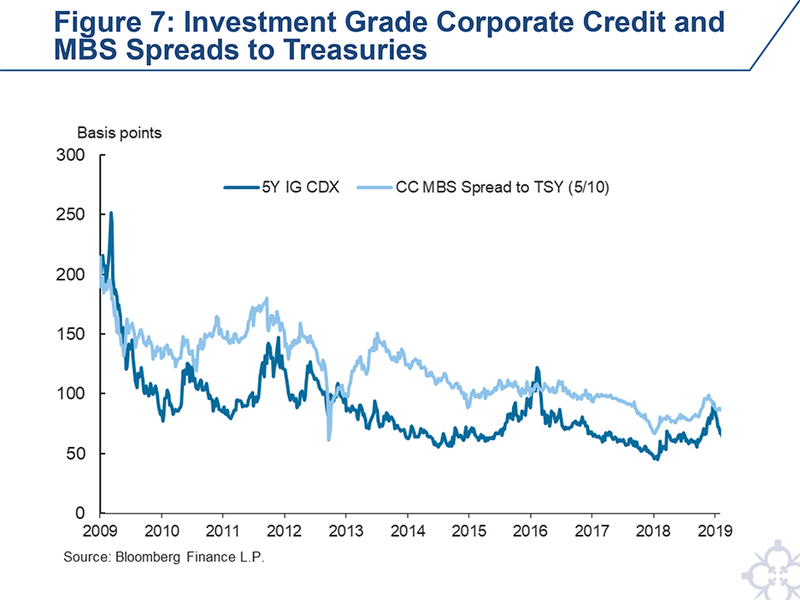 "16 This was a period of severe financial market turmoil and deep recession, so private sector buyers of MBS were on the sidelines, causing agency MBS spreads to be “abnormally” high due to market illiquidity and dysfunction. Research suggests that this purchase program reduced the portion of agency MBS spreads that was specifically considered to be “abnormal” by about 70 basis points over its first six months.17 In the framework noted above, these LSAPs worked primarily through the market functioning channel. However, research also suggests that borrowing costs were lowered more broadly through a portfolio balance effect as lower agency MBS spreads are required to induce existing investors to rebalance their portfolios into other securities.18 Overall, the Desk's purchases, aided by the FOMC’s lowering of its overnight federal funds target to the ZLB, resulted in lower mortgages rates, which in turn reduced the cost of home purchases and allowed existing borrowers to refinance at more attractive terms. LSAP 3, an outcome-based program that included purchases of $40 billion of agency MBS per month, was launched in September 2012, after the liquidity and market functioning of agency MBS had largely normalized. As the pace of economic growth remained modest, purchases were intended to provide overall policy accommodation by putting additional downward pressure on longer-term interest rates, making broader financial conditions more accommodative, and providing further support to mortgage markets.19 Consistent with these objectives, research suggests that MBS purchases in LSAP 3 worked primarily through the reduction of the general level of interest rates, with both agency MBS and Treasury security purchases having a similar effect on agency MBS yields and likely operating through the first four channels I noted earlier.20 While MBS purchases also lower MBS yields through the prepayment channel, a further benefit of agency MBS purchases during LSAP 3 may have been in facilitating a faster pace of long-term debt purchases by the Fed, relative to only purchasing sovereign debt. In doing so, agency MBS purchases enhanced the effects of the duration and portfolio balance channels by increasing the expected stock of the central bank's total longer-term debt holdings. In contrast to LSAP 1, it seems clear that LSAP 3 predominantly worked through channels other than the market function channel. Absent a conflicting policy objective, a central bank should aim to promote good market functioning in its operations to help ensure effective transmission to the rest of the financial system. As such, the Desk considered how to execute asset purchase programs in ways that avoided market disruption. If the Fed became too dominant a buyer or holder, it could have reduced the tradeable supply of targeted securities and discouraged trading among market participants, leading to diminished liquidity and price discovery, which could ultimately raise borrowing costs and undermine the program’s policy goal. Relatively quickly, the Fed came to learn that the reinvestment of principal payments received from securities held in its portfolio represented a distinct balance sheet tool that could help to maintain the FOMC’s desired level of monetary policy accommodation.26 This is because, in addition to the acquisition of securities through asset purchases, the period over which the central bank intends to hold its securities helps to shape market participants’ expectations about the size and duration of assets available to the public. Extending the holding period through reinvestments prolongs this so-called stock effect on the various transmission channels. Initially after the completion of LSAP 1 in 2010, the Fed was not reinvesting agency-related principal payments and the level of accommodation provided through each of the transmission channels likely partially reversed. Though these paydowns occurred over time, they amounted to a considerable reduction in the Fed’s agency MBS portfolio, with the $1.25 trillion purchased through the end of LSAP 1 in mid-2010 falling to about $800 billion by late 2011, when reinvestment of agency MBS principal paydowns into agency MBS were initiated. 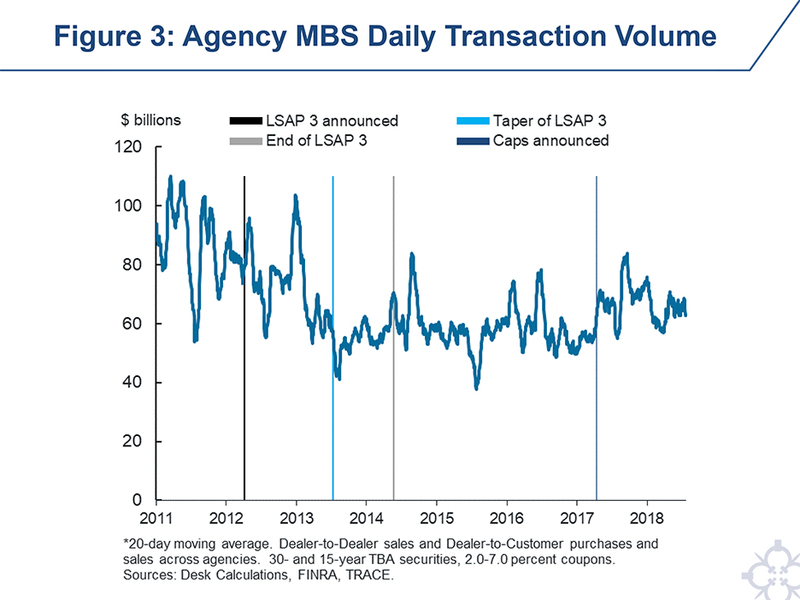 Once they began, cumulative agency MBS reinvestments summed to about $2 trillion through 2018—essentially 100 percent turnover of just over $2 trillion in agency MBS purchases through LSAPs. Figure 6 highlights the evolution of certain portfolio characteristics since the end of 2014. While much has been learned from our experience purchasing agency MBS, there is still room for further study. Very little is known about the effects that agency MBS purchases have on other non-sovereign assets. For example, consistent with the portfolio balance channel, market participants widely expressed a belief that agency MBS purchases had a positive effect on corporate bonds, and even equities, which may more directly influence economic outcomes. However, there has been little academic analysis to quantify this hypothesis, posing a potentially important area for additional study (Figure 7). Following the end of agency MBS purchases in late 2014, principal paydowns were fully reinvested until late 2017. Starting in late 2017, the Federal Reserve has decreased its agency MBS holdings by reinvesting principal maturities only to the extent that they exceed monthly caps that gradually increased up to a maximum level (Figure 8).27 This gradual and predictable approach is intended to reduce the balance sheet’s size at an appropriate pace while supporting good market functioning and mitigating the risk of sharp or outsized asset price reactions.28 Consistent with a gradual decline in the Fed’s agency MBS holdings, 30-year MBS option-adjusted spreads (OAS) have moved modestly higher, and respondents to the Desk’s January surveys expect approximately an additional 10 basis point increase in OAS in 2019 (Figure 9).29 This gradual increase in OAS may reflect the FOMC’s gradual and predictable approach to balance sheet normalization, but could also reflect additional factors. While uncertainty exists as to the precise impact of LSAPs and the relative importance of the various transmission channels, there is even less experience to draw upon in evaluating LSAPs’ reversal, making this another area for additional study. A separate challenge for the central bank to consider is how to maintain operational and analytical readiness over the long term as current operational needs evolve. For example, the Fed had no operational experience transacting in the agency MBS market prior to the crisis. It initially relied on outside investment advisors to support its first purchase program, before eventually bringing trading operations in house and then later, developing capabilities to conduct auctions on its proprietary auction platform.30 Doing so involved building out new operational practices and procedures, legal documentation, governance and reporting processes, counterparty administration, technological systems, and scaling learning curves for both central bank staff and market participants. In order for the Desk to be prepared for a wide variety of scenarios in the future, including sales or additional purchases, the Desk tests its capabilities through small-value exercises. These exercises are matters of prudent advance planning and portfolio administration by the New York Fed, and no inference should be drawn about the timing of any change in the stance of monetary policy in the future from them. In discussing its balance sheet reaction function in its Policy Normalization Principles and Plans, the FOMC has noted that it is prepared to alter size and composition of the balance sheet if future economic conditions were to warrant a more accommodative monetary policy than can be achieved solely by reducing the federal funds rate. However, the Committee has given no indication whether agency MBS would be included in future securities purchase programs. From an implementation perspective, the Federal Reserve is fortunate to have the option of implementing monetary policy in a large and liquid non-sovereign market with direct implications for existing and prospective homeowners, in addition to the U.S. Treasury market where it has the capacity to buy large amounts at a fast pace as illustrated by former Chair Janet Yellen in a speech at Jackson Hole in 2016.37 However, future policymakers will need to weigh these benefits versus credit allocation concerns in making that determination. 1 I would like to thank Brett Rose and Deborah Leonard for their excellent assistance in the preparation of these remarks, as well as colleagues in the Federal Reserve System for their insightful comments and suggestions. These remarks draw upon my prior material, including Concluding Remarks at the Monetary Policy Implementation in the Long Run Conference Federal Reserve Bank of Minneapolis, Minnesota, October 19, 2016, and Implementing Monetary Policy with the Balance Sheet, keynote remarks for the European Central Bank Workshop: Money Markets, Monetary Policy Implementation, and Central Bank Balance Sheets, Frankfurt am Main, Germany, November 6, 2017. 2 The share is calculated as of October 29, 2014, following the end of the third LSAP program; see Federal Reserve Bank of New York, System Open Market Account Holdings. The Federal Reserve also purchased approximately $175 billion of agency debt; as those holdings have matured, principal has either been reinvested in other security types or run off altogether. 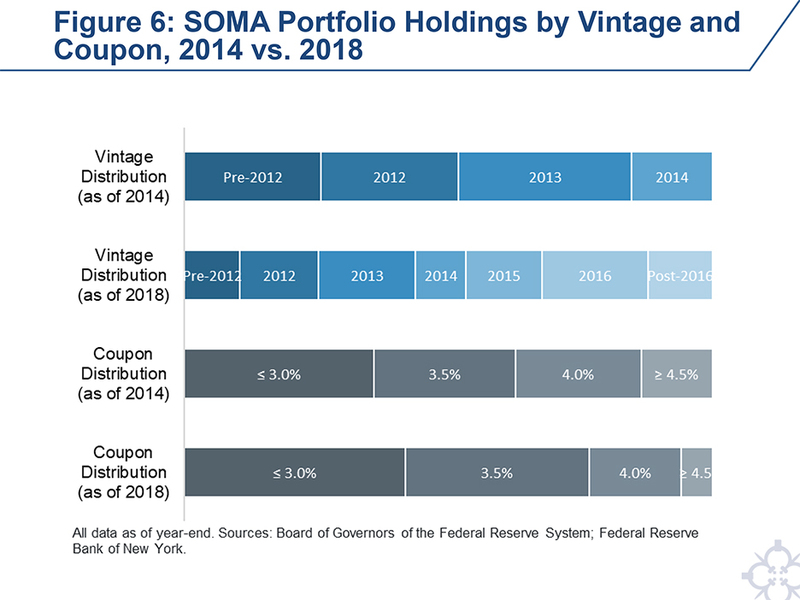 As a result, agency debt made up slightly less than 1 percent of the SOMA domestic portfolio at that time. 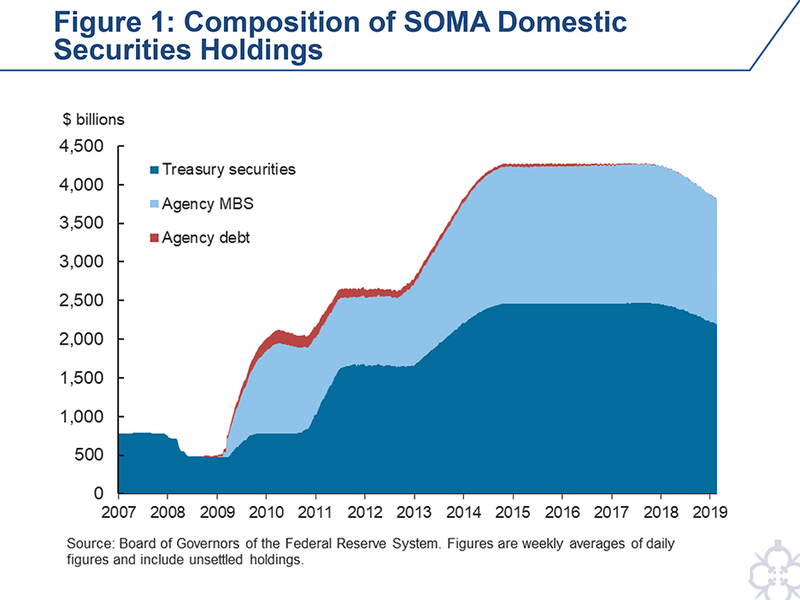 3 Cumulative purchases of agency MBS exceeded the SOMA’s peak level of holdings because principal paydowns from these securities were initially allowed to run off. 4 During the Bank of Japan's (BoJ) Quantitative Easing Program, which lasted from 2001-2006, the BoJ targeted the liability side of its balance sheet by explicitly targeting the level of current account balances. This objective was accomplished through repurchase agreements (repos) and purchases of Japanese government bonds with a remaining maturity of less than five years. Liability expansion was never a stated goal of the Federal Reserve’s LSAPs (rather, reserve expansion was a byproduct of asset-driven objectives)..
5 This channel usually relates to signaling about short-term rates. A variant is to target longer-term interest rates by a commitment to use balance sheet expansion if necessary. The European Central Bank’s (ECB) Outright Monetary Transactions program, created to purchase government bonds of euro-area countries that were granted financial assistance under certain conditions, was perceived as meaningfully reducing yields through commitment alone; no purchases were actually executed. In late September 2016, the BoJ unveiled a new monetary framework called "quantitative and qualitative monetary easing (QQE) with yield curve control." The new regime consists of two major components: (1) "yield curve control," in which the BoJ will target both short-end interest rates (with the deposit rate at -0.1 percent) and long-dated yields (around 0 percent for 10-year Japanese government bond yield), and (2) an "inflation-overshooting commitment," which amounts to maintaining monetary expansion until the 2 percent inflation target is exceeded in a stable manner. Under yield curve control, the BoJ will buy unlimited 10-year bonds in order to cap yields at a certain level, a little used measure given the central bank’s perceived commitment to maintaining its yield target. 6 Agency MBS, like the underlying mortgages, have monthly payments of principal and interest. Homeowners also have the option to make additional principal payments each month, or to pay off the loan in full. Prepayment is especially attractive when interest rates fall and homeowners are able to refinance their loans into new loans at a lower interest rate. Investors demand an extra return to bear the risk of prepayment, which is incorporated into the yield of agency MBS. 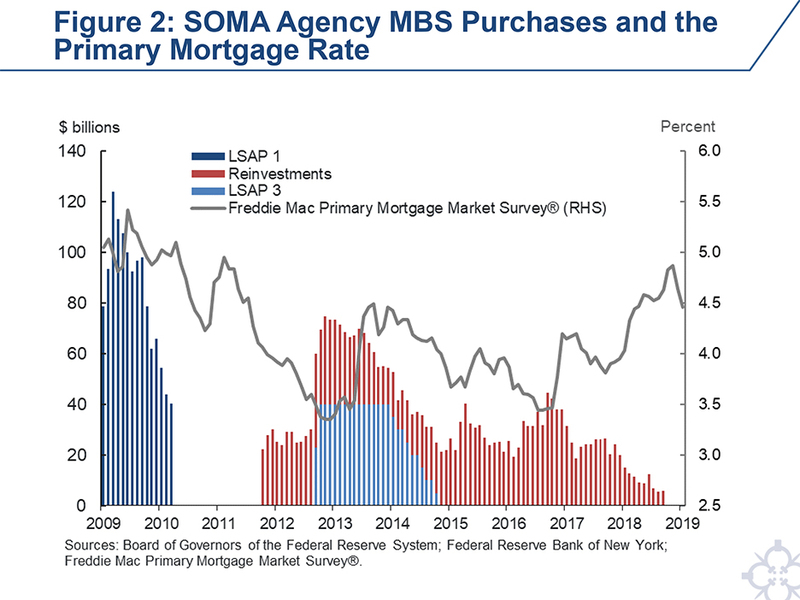 By purchasing agency MBS, the Federal Reserve can bear a considerable amount of this risk, removing it from the portfolios of private investors and thereby lowering mortgage rates. This outcome, in turn, stimulates additional demand for housing and promotes increased refinancing activity. 7 Volume figures as reported by eMBS. In contrast, the slightly larger U.S. corporate market has average daily trading volume of only $30 billion (according to the Securities Industry and Financial Markets Association), which would suggest that agency MBS are a more practical asset for the Federal Reserve than corporate bonds. However, as the Federal Reserve Act does not allow the purchase of corporate credit, that consideration is moot. 8 The TBA market is a forward market that allows any security with the same agency issuer, original maturity term, and coupon to be delivered into a single TBA contract. For more information on the TBA market, see James Vickery and Joshua Wright, TBA Trading and Liquidity in the Agency MBS Market, Federal Reserve Bank of New York Economic Policy Review 19, no. 1, May 2013. 9 For example, in September 2017, the New York Fed’s Open Market Trading Desk (the Desk) purchased more than $26 billion in agency MBS across only 13 different TBA contracts; upon settlement of those transactions, almost 2,000 different individual securities were delivered into the SOMA. 10 Dollar rolls, for example, can be used to address a shortage of a specific security that is expected to be transitory. This tool was used somewhat regularly for a small portion of the Fed’s agency MBS purchases. Coupon swaps can address shortages of a specific security that are not expected to be resolved quickly. 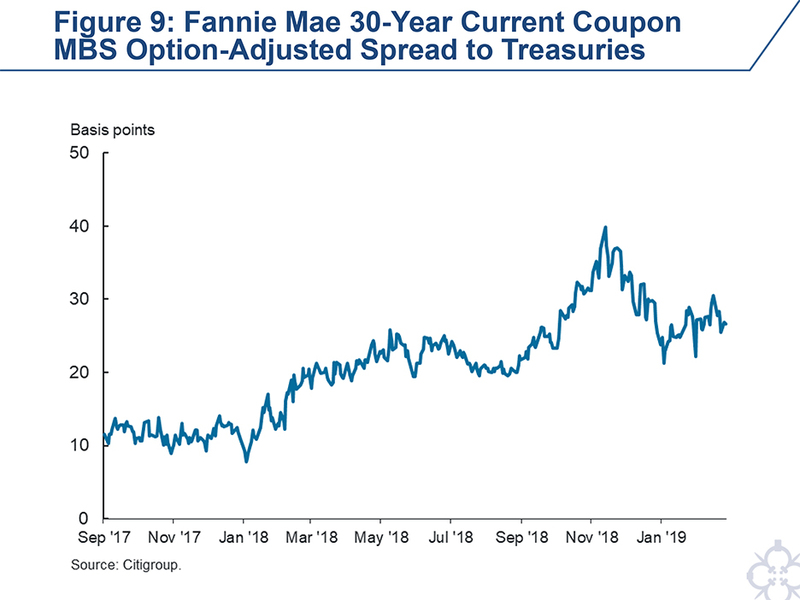 This tool was last used in June 2010 to facilitate the settlement of Fannie Mae 5.5 percent coupons, which stopped being originated shortly after purchase because of a sharp drop in primary mortgage rates. 11 For example, the Federal Reserve transacted in the agency MBS market via external investment managers at the start of its first LSAP program as a means of implementing the MBS program quickly and efficiently while at the same time minimizing operational and financial risks. Beginning on March 2, 2010, the New York Fed began to use internal staff to execute MBS purchases. See the Federal Reserve Bank of New York’s FAQs: MBS Purchase Program. 12 In addition, because agency MBS have uncertain monthly cash flows, they require sophisticated models to estimate cash flows, with associated implications for forecasting, risk measures, and accounting. 13 The FOMC’s Guidelines for the Conduct of System Open Market Operations in Federal-Agency Issues note that open market operations in federal-agency issues are not designed to support individual sectors of the market or to channel funds into issues of particular agencies. These guidelines were temporarily suspended in January 2009. 14 Of the three LSAP programs initiated since 2008, agency MBS were included in the first and third, with the second consisting only of Treasury securities. 15 Some surveys of the numerous studies of central bank bond purchase programs include: Joseph E. Gagnon, Quantitative Easing: An Underappreciated Success, Peterson Institution for International Economics Policy Brief, no. PB16-4, April 2016; Saroj Bhattarai and Christopher Neely, A Survey of the Empirical Literature on U.S. Unconventional Monetary Policy, Federal Reserve Bank of St. Louis Working Paper, no. 2016-021A, October 2016; and John C. Williams, Monetary Policy at the Zero Lower Bound: Putting Theory into Practice, Brookings Institution Hutchins Center Working Papers, January 2014. 16 Federal Reserve Board of Governors press release, November 25, 2008. 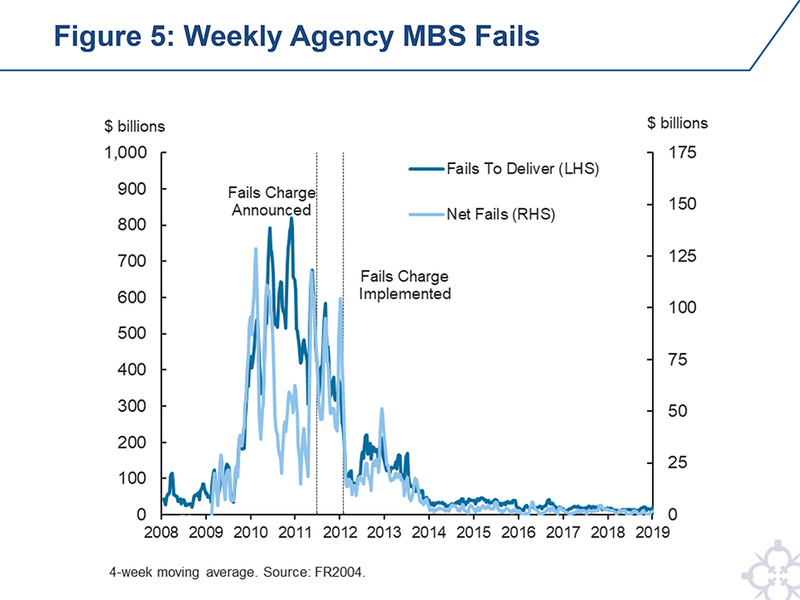 17 In that same time period, the spread of agency MBS repos to Treasury repos fell from more than 200 basis points to near zero. See Diana Hancock and Wayne Passmore, Did the Federal Reserve’s MBS Purchase Program Lower Mortgage Rates? Journal of Monetary Economics, Vol. 58, Issue 5, July 2011. 18 Joseph Gagnon, Matt Raskin, Julie Remache, and Brian Sack, Large-Scale Asset Purchases by the Federal Reserve: Did They Work? Federal Reserve Bank of New York Staff Reports, no. 441, March 2010, found that LSAPs led to economically meaningful and long-lasting reductions in longer-term interest rates on a range of securities, including securities that were not included in the purchase programs. These reductions in interest rates primarily reflect lower risk premiums, including term premiums, rather than lower expectations of future short-term interest rates. 19 Note that at that time, the Federal Reserve was also undertaking a program to extend the maturity of its Treasury holdings by selling shorter-maturity Treasury securities and purchasing longer-maturity Treasury securities. When the Maturity Extension Program expired in December 2012, purchases of $45 billion per month in Treasury securities were added to the LSAP 3 program. 20 Diana Hancock and Wayne Passmore, How Does the Federal Reserve’s Large-Scale Asset Purchases (LSAPs) Influence Mortgage-Backed Securities (MBS) Yields and U.S. Mortgage Rates? Real Estate Economics, Vol. 43, Issue 4, October 2015, estimated the impact of the purchase of a 1 percent market share of the agency MBS and U.S. Treasury markets to be 2.0 basis points and 2.5 basis points, respectively. At current market sizes, these estimates suggest that $28 billion of agency MBS purchases or $42 billion in U.S. Treasury purchases would lower agency MBS yields by 1 basis point. 21 Broad market indicators of market functioning include, among others, trading volumes, bid-ask spreads, trade quote sizes, financing costs, and settlement fails. Operations also yield valuable information, including executable prices compared to those prevailing in the market, counterparty concentration measures, and settlement fails. John Kandrac, The Costs of Quantitative Easing: Liquidity and Market Functioning Effects of Federal Reserve MBS Purchases, Board of Governors of the Federal Reserve System, International Journal of Central Banking, Vol. 14, no. 5, December 2018, notes some modest costs of the agency MBS purchases in LSAP 3. 22 Treasury Market Practices Group, Announcement of Revised Fails Charge Recommendations for Agency Debt and Agency MBS Markets, June 28, 2011. 23 See Federal Reserve Bank of New York, FAQs: MBS Purchase Program, Effective December 30, 2008 for more discussion of the initial investment strategy. 24 See Federal Reserve Bank of New York, FAQs: MBS Purchase Program, Effective March 24, 2009 and FAQs: MBS Purchases, Effective September 26, 2011 for more details on the investment strategy. 25 A dollar roll sale is a transaction that involves the sale of agency MBS for delivery in one month and the simultaneous agreement to purchase substantially similar securities in a later month, thus effectively postponing delivery when there is a dislocation in available supply. 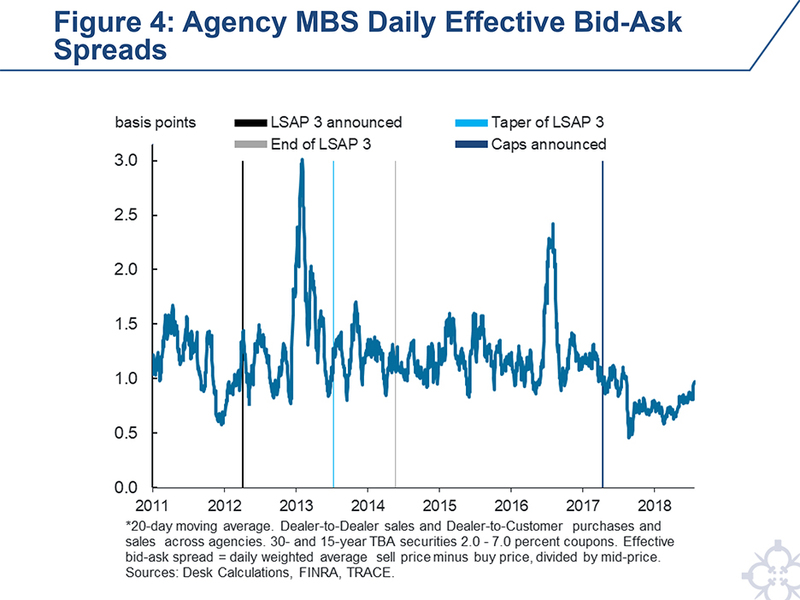 The Fed also used coupon swaps to settle some agency MBS purchases under its first purchase program. A coupon swap is the simultaneous sale of one agency MBS and purchase of another agency MBS, which may have a different coupon, issuer, or both. 26 The FOMC initially allowed agency debt and agency MBS to run off as principal was repaid. In August 2010, the FOMC announced it would reinvest principal payments from these securities in longer-term Treasury securities. Then, in September 2011, the FOMC announced that repayments from these securities would instead be reinvested in agency MBS. See Minutes of the Federal Open Market Committee, August 10, 2010, and Minutes of the Federal Open Market Committee, September 20-21, 2011. 27 Federal Reserve Bank of New York, Statement Regarding Reinvestment in Treasury Securities and Agency Mortgage-Backed Securities, September 20, 2017. 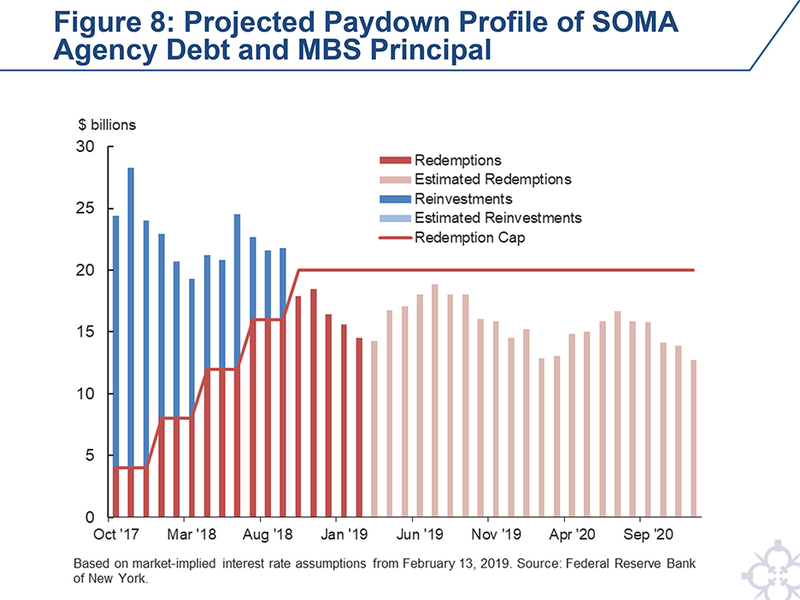 In Figure 8, the length of the dark red bars show the actual amounts of agency debt and MBS principal that paid down in par amount; only the amounts above the cap, shown in blue, were reinvested. The lighter red bars in Figure 8 show the projected cash flows through the end of 2019. Principal paydowns have been below the caps since last October, and the portfolio size has declined by the amount of principal repayment. 28 In addition, the caps would provide valuable protection against a rapid portfolio runoff if long-term rates were to fall meaningfully, causing agency MBS principal paydowns to rise significantly. 29 In advance of each FOMC meeting, the Desk surveys primary dealers and active investment decision makers about economic and financial market topics to gain insight into their expectations. See Survey of Primary Dealers and Survey of Market Participants, which have median expectations of 8 basis points and 10 basis points respectively. 30 Previously, agency MBS operations were conducted on a commercial dealer-to-customer trading platform. The switch to FedTrade minimized operational risk, improved efficiency and competitiveness, and increased transparency around the Fed’s mortgage operations. 31 The Minutes of the Federal Open Market Committee, January 29-30, 2019, noted that almost all participants thought that it would be desirable to announce before too long a plan to stop reducing the Federal Reserve’s asset holdings. At that time it would be appropriate to reinvest most, if not all, principal payments received from agency MBS in Treasury securities. Some thought that continuing to reinvest agency MBS principal payments in excess of $20 billion per month in agency MBS, as under the current balance sheet normalization plan, would simplify communications or provide a helpful backstop against scenarios in which large declines in long-term interest rates caused agency MBS prepayment speeds to increase sharply. However, some others judged that retaining the cap on agency MBS redemptions was unnecessary at this stage in the normalization process. 32 See Federal Reserve Bank of New York, Statement Regarding Agency Mortgage-Backed Securities, September 14, 2018. 33 See Minutes of the Federal Open Market Committee, December 18-19, 2018. The FOMC’s Policy Normalization Principles and Plans note that the Committee currently does not anticipate selling agency mortgage-backed securities as part of the normalization process, but that limited sales might be warranted in the longer run to reduce or eliminate residual holdings. 34 One example of an agency MBS sales program is the U.S. Treasury's decision to liquidate its $142 billion agency MBS portfolio in 2011 through a combination of about $10 billion per month in sales and ongoing principal paydowns. The Treasury announced on March 21, 2011, that it would wind down this portfolio and sales took place between March 22, 2011, and March 13, 2012. 35 Because of improved prepayment characteristics, agency MBS that have been outstanding for a number of years are often more valuable than newly issued securities that are otherwise similar. Therefore, these older securities tend to trade at a higher market price than the TBA market price, making them unsuitable for trading through the TBA market. 36 Federal Reserve Bank of New York, Statement Regarding Agency Mortgage-Backed Securities, September 14, 2018, noted that the Desk plans to develop its operational readiness for conducting transactions in UMBS and, to more efficiently manage the SOMA portfolio, convert some of its agency MBS holdings to UMBS where appropriate. 37 Janet L. Yellen, The Federal Reserve's Monetary Policy Toolkit: Past, Present and Future, opening remarks at the Federal Reserve Bank of Kansas City’s Economic Policy Symposium, Designing Resilient Monetary Policy Frameworks for the Future, Jackson Hole, Wyoming, August 26, 2016, notes that asset purchases are expected to remain an important part of the Fed’s policy toolkit.